#65 — 6 Myths of Facebook… or Are They? SketchDeck researched, in side-by-side comparisons, 6 myths about Facebook ads and it turned into a great example of content marketing for the startup company. They did everything right to attract the target audience they wanted and the post went viral. But what about the actual content of the post? 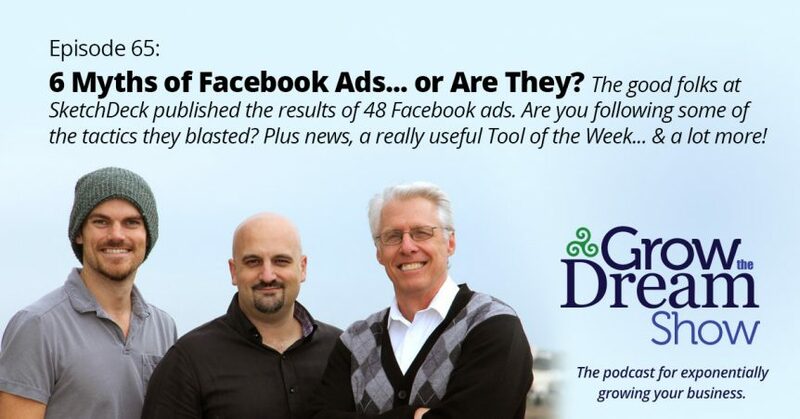 Well we have several questions about the methodology of the post and how useful it is for Facebook advertisers. But whether it is great methodology, it raises some good issues for anyone advertising on Facebook, such as: Do relevant images and text over images make for better ads? Interesting results! Plus… news & a really useful Tool of the Week! Facebook updates their “Lead Ads” product with pre-filled forms. Comcast buys Dreamworks (Wall Street Journal) — what does this say about the importance of video and animation? The iTunes store turned 13 years old last week (a teenager! ), but is still just as bad as it was back in 2003 (Quartz). Google Play Music has finally released podcasts! Subscribe to our show here. SketchDeck published the details of their Facebook Ad tests, with 48 variations on the images accompanying the ads. It appears that their intent from the beginning was to “bust” 6 myths. Did that affect their science? Even if it did, it’s a world-class content marketing win that we might all take some notes on. Tons of tabs open? Is Google Chrome killing your memory & CPU? Check out One Tab. Pack up your tabs and keep them neatly organized & accessible with this Chrome extension or Firefox Add-on. Video for this episode is coming soon. Watch this space for details!